When it comes to an exhibition where I am sold on the title alone, then this has to rank right up there. Regular readers of the exhibitionologist will know, photographs -particularly old, scratchy, black-and-white ones- and the history of London constitute two of my special areas of interest. So the Victorian London in Photographs exhibition at the London Metropolitan Archives constituted a must-see, as it surely does for those with similar interests to mine. It is testament to the scope of the Victorians’ ambition and industriousness that Victorian London feels, to some extent at least, something that still exists today. As Londoners we are surrounded by Victorian buildings, from the icons like Big Ben and Tower Bridge that have come to define the city, to the majestic town houses that a large number of us live in. While the underground city which the Victorians built we still rely on every time we travel to work by tube and every time we flush the toilet. 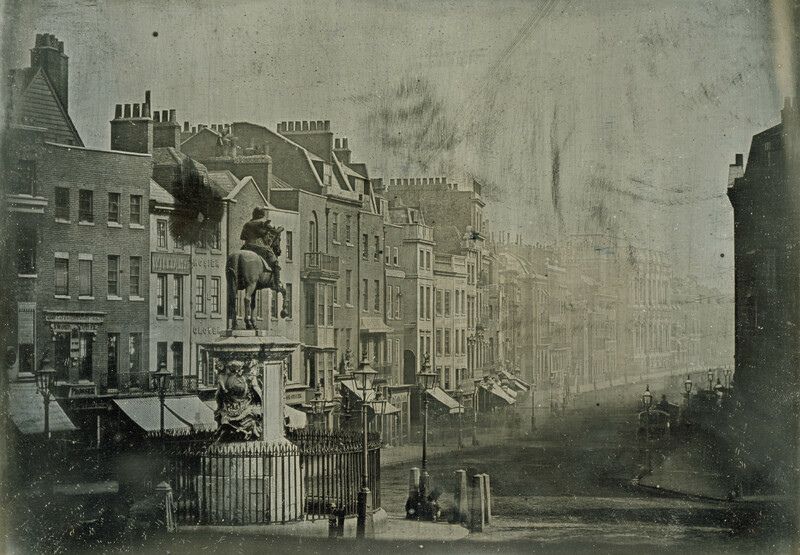 Yet, as illustrated very simply and effectively by the large photograph on the wall that we see as we enter this exhibition, the London of the 19th century looked completely different to the London of today. Dominated by the instantly familiar dome of St Paul’s this view of the City of London skyline may be, but besides for one other church steeple in the foreground, there are no buildings that form part of today’s skyline in the picture. A large number of buildings in this particular part of the capital were destroyed during the Blitz, and the buildings that were either built in their place during the postwar period, or have come along more recently, have completely changed the character of the area. However, as this exhibition reminds us, the Victorians themselves were responsible for a sizeable amount of destruction of their own. And while the buildings they constructed have stood the test of time far better than most of the monstrosities built in post-World War II era, it is important to remember how the constant recycling and rebuilding of London’s streets stretches as far back in time as the city itself. Indeed, it was the accelerating pace of the change that was going on all around them that compelled photographers to take most of the pictures in this exhibition in the first place. The Society for Photographing Old Relics of London, founded in 1875, may not have had any means of halting or preventing the greedy metropolis’s rampant and relentless development, but they could at least document fragments of the London built by the Georgians, the Stuarts and the Tudors before they disappeared forever. Their archive totals only one hundred or so pictures, but each and every one is an enthralling window into the past. Even the buildings that the society photographed that were not pulled down, and still survive, look somehow older than they do today, thanks to the black coal dust that smothers every wall and window. It was the impending demolition of the Oxford Arms, one of London’s last remaining seventeenth century coaching inns, that had led to the formation of the society. And, significantly, within two years of the building’s destruction, the Society of the Protection of Ancient Buildings had also been established, the first organisation of its kind in Britain. For the most part, I found the most interesting of all the photographs of this exhibition the ones that show not the London that was built during the Victorian era, but the London that vanished during the Victorian era. It is the little details in these photographs that make them so compelling, particularly the ones of construction sites, with their dozens of workers (or ‘navvies’, whose muscle power did nothing less than build modern Britain) scattered about. Some toil away while others stop to look at the camera. Their flat-caps and filthy clothes contrast the suited, top-hatted men that stand and survey the scene. While amid the chaotic mess of bricks, cranes, planks and ropes, there are large boards plastered with advertising. Even more advertising, it seems, than one would see on building sites today. Tube enthusiasts will no doubt enjoy the extensive collection of photographs of the London Underground (or rather, the Metropolitan Railway, as it was called then) under construction. Before tunnel-boring technology came along in the 1890s, these subterranean railways had to be dug, laid and then built-over again, a monumental undertaking even without the vast amount of demolition that was usually required in the process. 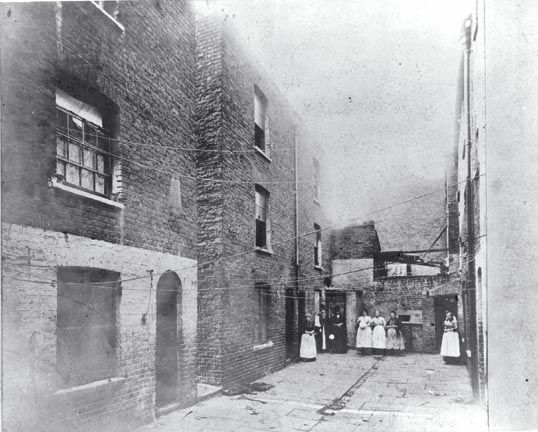 While many of the rickety houses lining Diagon-Alley-type streets that were destroyed by the Victorians undoubtedly possess a charm and a character that might make a modern viewer mourn their loss, many of the photographs in this exhibition that document street life in Victorian London show how so appallingly deprived these areas usually were. Shining a light on the immense gulf between London’s rich and poor was the motivation for another type of photographer emerging during this period, the photojournalist (such as John Thomson, whose remarkable collection from 1877 is only display). The men, women and children that they captured in their pictures represent the industrial revolution’s human casualties. It is not exactly surprising that, along with the profit-hungry developers, it was the Metropolitan Board of Works and later the London County Council – the civil bodies whose job it was to improve London for its inhabitants – who were so keen to sweep away these dark and dirty corners from the gleaming capital city of empire. The removal of London’s overcrowded and disease-infested slums was seen as not only desirable but necessary for the construction of new roads, desperately needed in the heart of the capital to help traffic flow smoothly, and prevent the world’s most important centre for trade and commerce grinding to a halt. From Shaftesbury Avenue to Charing Cross Road, from the Victoria Embankment to the Holborn Viaduct (several incredible images of its constriction in the exhibition), the Victorians drew new lines on the map of London again and again. But there was virtually no attempt made to rehouse the thousands of people displaced, at least not until the very end of the nineteenth century with the arrival of the first social housing projects. And so, once again, a large number of the city’s poor became the victims of progress. The toughness and brutality of life in Victorian London is certainly a theme of the exhibition, and is captured most poignantly by a series of portraits of inmates of the Colney Hatch Lunatic Asylum (the site of, as I have discovered subsequently, the deadliest peacetime fire in London since medieval times, when 52 inmates were burned to death in 1903). They are displayed as a slideshow, with only their names as an accompaniment. The contrast between the hazy, blurry images of London’s bustling streets, and these still, razor-sharp portraits could not be greater. With their basic, nondescript clothing and shorn hair these photographs look like they could have been taken yesterday. While some have the kind of haunting glare that hints at severe mental illness, others look perfectly serene, almost friendly. In an age where anything from epilepsy to depression could wind you up in one of these nightmarish asylums, I suspect that for all of the people in these photographs, there’s was a bleak existence indeed. Thankfully, it is not all doom and gloom, with the vibrancy and colourfulness of London life on display in many of the street scenes. There is a particularly amusing collection of images lining the staircase leading up to the exhibition space showing street traders, food sellers and musicians on the pavements of Greenwich. And there was one picture I particularly enjoyed of a couple having their photograph taken on Clapham Common, serving as a reminder of what a novelty photography still was in this era. My only disappointment with this exhibition was that it felt rather small. In fact the exhibition space is only one, not particularly large room, tucked in between the offices of the London Metropolitan Archives. With such a vast archive of images, I probably would have made an exhibition covering ten rooms given the chance. But perhaps then only people like me, who finds photographs like this (quite literally) endlessly fascinating, would make it all of the way round! Victorian London in Photographs runs at the London Metropolitan Archives in Clerkenwell until 29 October 2015. Entry to the exhibition is FREE. Tags: asylum, daguerreotype, exhibition london 2015, exhibition reviews london, exhibitions london, John Thomson, London, London Metropolitan Archives, London Underground, photograph, photojournalist, slum, Society for Photographing Old Relics of London, The Oxford Arms, Victoria Embankment, Victorian, Victorian London in Photographs, Victorian London in Photographs review, Victorian London Photographs exhibition, Victorians. Bookmark the permalink. Interested in old photographs? Fabulous review of the Victorian London in Photographs exhibition. Brilliant review of a wonderful exhibition, thanks. I’ve reblogged. I share your passion for London history and old photographs. Throw in some old maps and I’m in heaven. Good post. Great article–it is amazing how bleak the photographs of “real” London life were, as opposed to the beautiful, idealized images of, say, Julia Margaret Cameron. Those early photographs did have an authority, didn’t they? I suppose fewer people had cameras, they were bulky and fiddly, and taking a photo was a time-consuming, difficult process. So when they took a picture, they took real care when they did it. Something to to with that, at least!